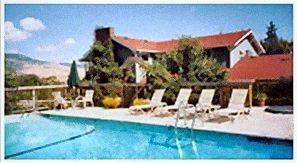 A resort-style inn, snuggled against a rolling hillside on a lush five acres of farmland, surrounded by the Siskiyou and Cascade Mountain ranges. Enjoy willow furniture on two spacious porches, heated swimming pool open Spring through Fall, and Jacuzzi, available year round. Spend a day hiking on the trails, bicycling the country roads, horseback riding at a nearby ranch, skiing the nearby Mt. Ashland, or picnicking in Ashland, Oregon's beautiful Lithia Park. Wireless Internet access in each room. Stay in one of the four quiet rooms in a restored 1890s farmhouse, or in one of the four rooms that the barn has to offer. We also have a large private cottage waiting to accommodate you. Our rates range from $95 to $245 depending on your time of stay. VISA, MasterCard, Discover and American Express are excepted. Children over the age of 12 are welcome. This and other Oregon Bed and Breakfast Inns can be found here online in The Register.